The Caribbean, 1726. The Captain of the Shirley’s Revenge is disturbed when he sees a ship belonging to the mysterious tyrant known as the Kraken speeding toward him. The Kraken’s men, led by the shrouded Captain Rhodes, board the Shirley’s Revenge and attack. Suddenly, the Turtles blip in, dressed in their samurai gear. 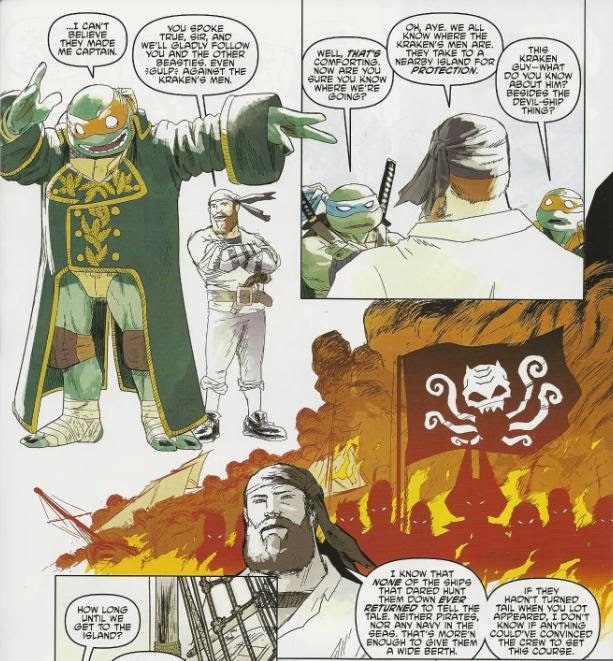 Captain Rhodes thinks the Turtles are part of one of the Kraken’s schemes and orders his men to retreat on their high tech ship. The Captain of the Shirley’s Revenge is immediately suspicious of the Turtles, but Raph disarms him. 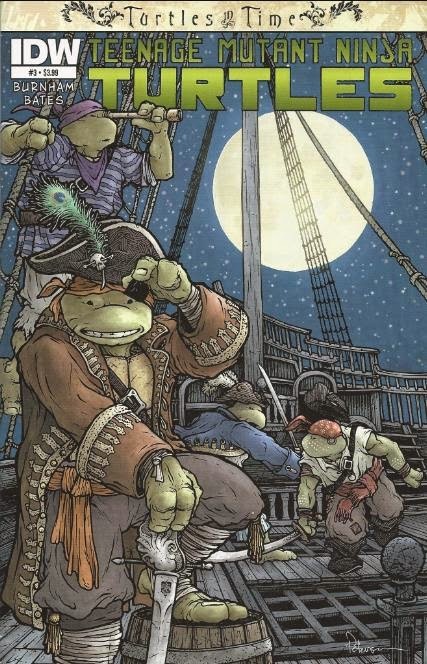 The First Mate tells the Turtles that the crew of the Shirley’s Revenge aren’t marauding pirates like most others, but simply trying to find a free land where they can settle and only kill when they’re threatened. He tells them that the Kraken is a mysterious, supposedly demonic entity who gives his minions (led by Captain Rhodes) supernatural powers. The Turtles suspect there’s more to the Kraken than meets the eye and suggest that they all go track him down and end his tyranny. The Captain is against the idea, but Michelangelo gives an inspiring speech about standing up for yourself. The crew immediately makes Mikey the new Captain. The First Mate says that there’s an island where the Kraken is rumored to hide out, but it’ll take three days to get there. 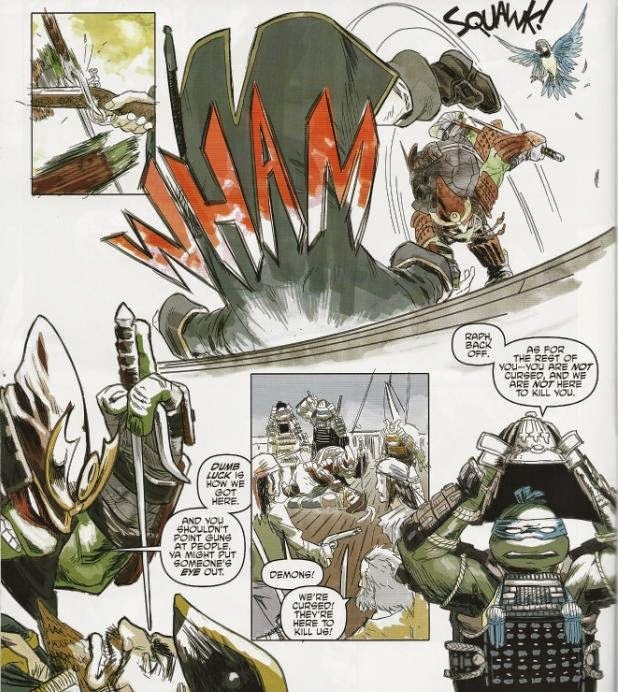 Over the course of those three days, the Turtles teach the crew what they know about weapons, fighting and cooking, while the crew teach them basic seamanship. Mikey has a talk with the Ex-Captain, who is still against the idea of looking for trouble. Mikey gives another longwinded speech, this time about running from the past and fearing the future, which is how the Ex-Captain has been living all this time. Meanwhile, at the island… BURNOW Island… Captain Rhodes meets up with the Kraken when a proximity alarm goes off. The Kraken turns out to be Krang and he’s rather miffed that the human he hired to keep trespassers away from his facility has failed. Captain Rhodes claims he could better fend off intruders if he had some of Krang’s strange weaponry and Krang reluctantly gives him the use of a single laser pistol. Krang then leaves to attend to business elsewhere, but informs Rhodes to get the job done or pay the price for failure. Offshore, the Shirley’s Revenge is rammed by the Kraken’s high tech ship and once again boarded. During the skirmish, Renet blips in and Captain Rhodes fires his laser pistol at her. Mikey pushes her out of the way, but takes the blast right to his plastron and falls into the water. The other three Turtles dive in after him as Renet blips away again. The Ex-Captain uses his cutlass to destroy the laser pistol and challenges Rhodes to a duel. The two clash swords and Rhodes accuses the Ex-Captain and his crew of not being real pirates because of their code against lawlessness. The Ex-Captain tells Rhodes that he’s the phony, as he surrendered his freedom to a lord and master. The Ex-Captain defeats Rhodes just as the Turtles climb back on deck. The Ex-Captain offers Rhodes’s men the opportunity to either work with him or join Rhodes in the nearest prison. The men choose to join the Shirley’s Revenge and Mikey gives the Ex-Captain some words of encouragement before he and his brothers blip away. The Now-Captain-Again then tells his crew that they won’t be stealing any of the Kraken’s bedeviled weaponry for themselves, however, they will endeavor to make the area safe once more. 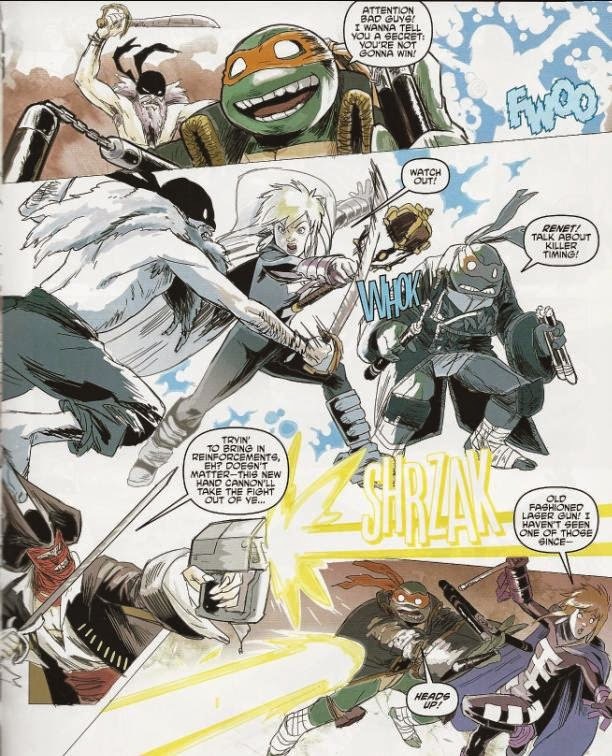 *This story is continued from TMNT: Turtles in Time #2. The story concludes in TMNT: Turtles in Time #4. *The fate of that mutagen-covered gator will be revealed in TMNT (IDW) #56. *This issue was originally published with 2 variant covers: Regular Cover by David Peterson, and Subscription Cover by Ben Bates. “Turtles in Time” seems to be going back and forth in terms of tone, from lighthearted to serious and now back to lighthearted. While the attitude might be inconsistent, it at least keeps us on our toes. Burnham’s go with this installment is mostly comical and goofy, perhaps a little too much at times, but it’s a welcome break from the seriousness of the main title. Anyway, it functions as a reminder that the IDW universe isn’t all business, all the time. Of the issues so far, I think this one was the weakest. It’s in more of a hurry than the last two stories and Burnham has to resort to some storytelling cheats to move things along. He tries to cover up some of the shortcomings (such as the crew of the Shirley’s Revenge mindlessly following Mikey for the sake of narrative convenience) by putting a lampshade on things and playing them for laughs. While it takes the edge off, the story is nonetheless rushed because of it. I know the writers have to keep each era to a single issue and so matters of convenience are a necessary evil, but there’s just way too much of it in this installment for any lampshade to obscure. And silliness doesn’t always come to the rescue, either. This was the first era visited in the miniseries that required exposition and setup. The Mesozoic era didn’t need any of that since its all dinosaurs and even the stuff with the Utroms was established during the “Utrom Empire” mini. Feudal Japan didn’t need any because the main title has been visiting that era since just about the beginning and we’re already familiar with the setting and cast. This issue was essentially an untapped point in time and so Burnham didn’t have the convenience that the other issues had. So what we get are lengthy monologues from the Captain and First Mate explaining everything and it can get a little tiresome. Add in Mikey’s exhaustive and corny speeches and it can get REALLY tiresome. 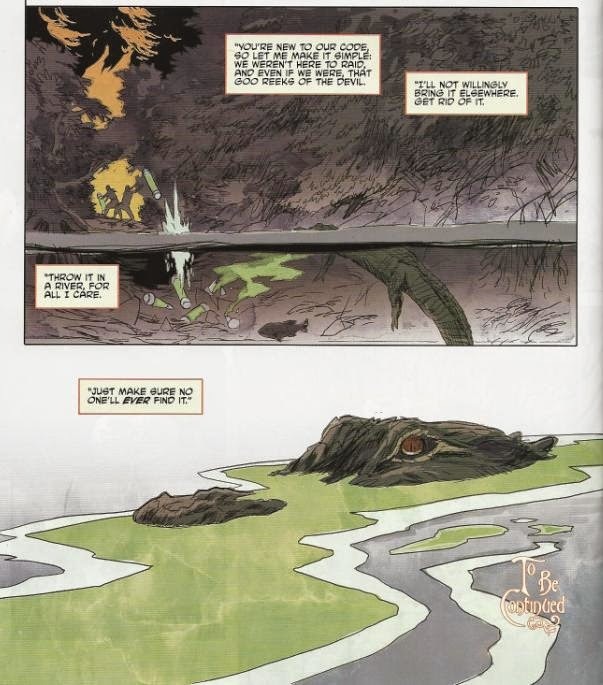 All that said, this issue continues the world-building of the last two, as the Turtles inexplicably have a hand in major events that would impact their present. 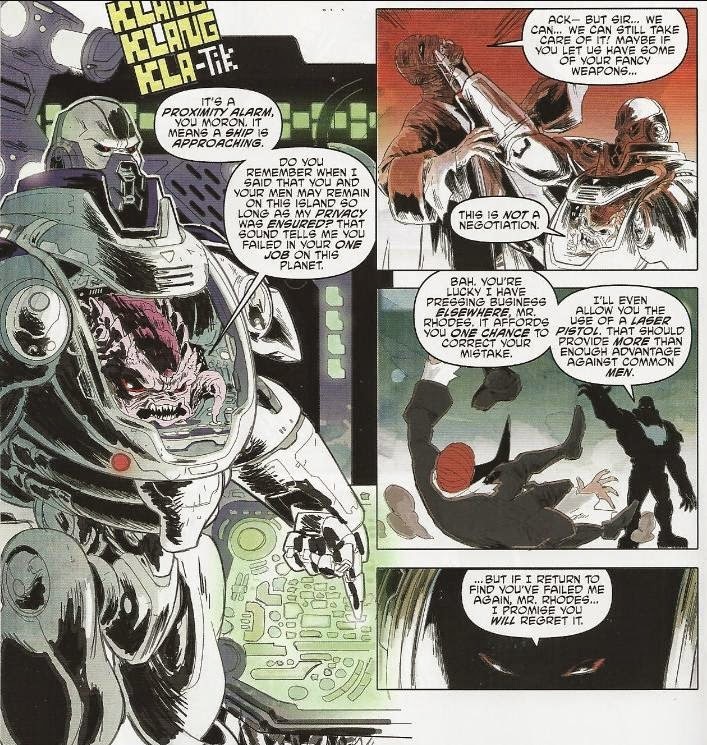 It looks like Krang was exploiting other humans besides Oroku Saki throughout history, and whereas the whole “Iron Demon” persona failed, the “Kraken” identity seemed to work out a bit better (a bit). And of course, I’m excited about what that last panel teaser implies. Ben Bates returns to the Turtles, though you might not recognize him at first. He colored this issue and his personal style is very different from Ronda Pattison’s. He gives everything this white-washed, sun-bleached look and it befits a tale set in the Caribbean. Actually, it REALLY fits and I absolutely love it. When you look at these pages, you want to rub your eyes like you’re sun blind and it’s a perfect example of a coloring style that complements the artwork 110%. His layouts and his pencils are great, too, don’t get me wrong, but the colors deserve a special notice. Art and colors aside, I wasn’t too thrilled with this installment in “Turtles in Time”, though I still enjoyed it. Some of it works and some of it doesn’t (especially in regards to the jokes), but there’s a lot to like about the issue from any angle. Didn't this happen in one of the issues of the Mirage comics? Four canisters of mutagen could create an assload of mutants. Also, the presence of the fish tells me we could be seeing the origin of the fish-people from the old Mirage #28. This one bore me until BURNOW ISLAND (in caps) hit me in the face and had me realize a few panels in advance that Krang was the Kraken. My favorite panel was the one with the shirtless captain slicing the gun. If that's not an Old Spice commercial waiting to happen I don't know what is. Lastly, before I saw the gator I got excited for Ray Fillet. My favourite part was eye-patch Raph. That was afun easter egg.